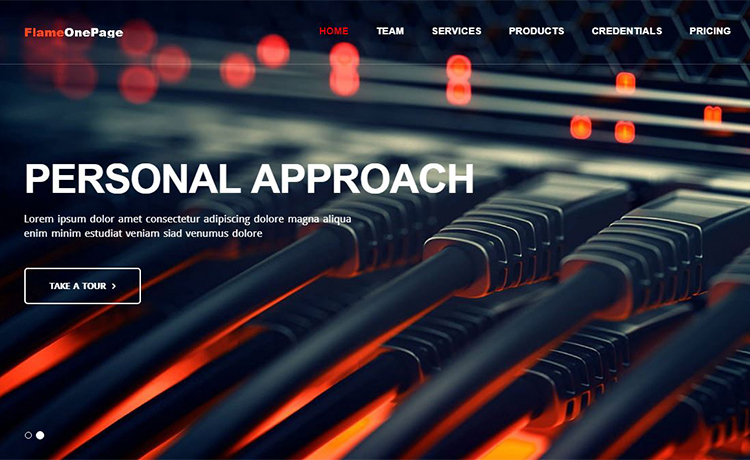 Flame-free Bootstrap one page template you can choose undoubtedly for your business,agency or portfolio website. It is free to download and good in quality. Having an online presence is a positive thing nowadays which brings more proficient results. Whether it is a commercial business agency or personal portfolio, a website is a must. Flame one page is a free Bootstrap one page template suitable for any type of website. For small agency, office, corporate, business or portfolio – Flame one page is a beautiful HTML5 template to choose. Flame is a free one page template with a simple, clean and elegant design that is eye catchy and attract visitors and potential clients. It is an HTML5 free Bootstrap template perfect for your site page and it is totally free. It comes with a sliding background header, fixed menu bar and a lot more features. You can choose this Bootstrap one page scroll template for a startup or business company website. Flame one page – a Free Bootstrap template has a well-commented code. There are marker tags with every section so one can easily tell which one is what and what to change. One can customize this free template as per choice without any coding knowledge. Just replace the texts and contents with your own and go live. You don’t have to know a single line of code or be a professional coder. This template is a perfect suit for personal, marketing, multipurpose, hosting, photography, or any other homepage. Flame is a responsive and mobile-friendly template. People are browsing the internet from mobiles and handheld devices on the go. Browsing from Desktops/Laptops rate is lower than browsing from mobiles and handy devices. So, mobile-friendly and responsive to any devices and browsers is a must feature any template or website should have. Flame is no different. It supports on any handheld devices as well desktops and PCs regardless of screen resolution. Besides, it is a one page responsive website template that supports all the key browsers we use. You can check the responsiveness and mobile friendliness of this Free Bootstrap One page Template on Am I Responsive and Google Mobile-Friendly Test. The whole point of making a website will be doomed if the search engines don’t rank your site in the search list and no one ever finds out about your site. So, a website must be Search Engine Optimized so that the search engines like Google, Yahoo, Bing and so on rank your site higher. Flame one page is a free website template with SEO friendly features. If you change the texts and contents in the right manner, Search Engines will surely rank your site. To know more about SEO you can have a look at Google SEO Friendly Guide. You can browse also all premium templates and free responsive templates offered by Themewagon. This useful simple template was designed by Fairtech team. This template is super responsive, features are also workable. As a free template it has many options to make a website easily. I appreciate your effort. This is the template I was looking for to create a website for my small digital farm. Thanks for adding it. Can’t you download? Please try again. Download link never arrived. Tested with two different e-mails. Fake! Please add your email here. I’ll send you the download link. There might be some troubles. Can I use your images? Thanks. Sorry, we can’t say about it. You may contact the author. See the bottom side of the right sidebar on the theme page. Hi Ömer, please check your inbox & thanks for letting us know. Sorry, there was an issue in the email sending server.